You, too, can be an advocate. Here’s how. Speaking out against injustices is as important as ever, and joining a network of people living with HIV is an effective way to do so. Such groups can help focus your HIV advocacy and link you to powerful people in your community, which will give your words more weight. To self-advocate, know your rights so you can take action against those who discriminate. Under a wide array of laws—including the Americans with Disabilities Act, the Fair Housing Act and the Affordable Care Act—the rights of people living with HIV extend to housing, medical care, public facilities, education, transportation and more. In addition to joining a national network, consider assisting local HIV organizations. You could volunteer once a month or become employed full-time—whatever works for you. And you can connect in many different ways, such as conducting HIV tests, doing community outreach or lending emotional support to people living with HIV. Consider joining a support group or becoming a one-on-one mentor. Helping the newly diagnosed to access health insurance, join clinical trials and secure housing or other supportive services can help them live better with HIV. Donating to HIV-related causes is also a form of advocacy. It can be anonymous, it’s tax-deductible and it may take only minutes of your time. Strapped for cash? You can also help raise money in more grassroots ways, like coordinating parties, bake sales or other fundraising events. Speaking out about HIV with your family, friends and other trusted people in your social circle isn’t just a good way to find support—it’s also a way to put a face to the epidemic and educate your loved ones about living with HIV today. You can also speak out on social media. Put your money where your mouth is. There are many opportunities to fight HIV through your fashion and gift choices. Buying merchandise from HIV organizations helps not only to raise money but also to bring awareness to the epidemic. Whether in the form of a simple red ribbon or a “Silence = Death” pin, wear your support. Getting educated about HIV is often the first step toward HIV advocacy. Knowing facts about the virus and treatment can help you make better decisions about your own care and well-being. It will also empower you to help others more effectively. To get the care you and others deserve, knowledge about HIV is key. Knowing your HIV status, whether negative or positive, puts you in the best position to protect your health and the health of your sexual partners. If you’re HIV negative, make an HIV test a part of your regular checkups. If you’re living with HIV, talk to your friends and colleagues about why getting an HIV test is so important. Sharing your HIV status, whatever it is, isn’t always easy, but doing so helps to normalize disclosure, which in turn fights stigma. Whether you’re HIV positive or you’re HIV negative, we’re all in this fight against the virus together. 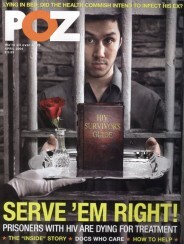 Go to POZ.com/Advocacy for more information. 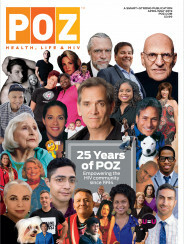 Click here to download a PDF of the POZ advocacy poster.